The day after its January 5 debut, CloudOn became the number one app in the iTunes App Store, says CloudOn CEO Milink Gadekar. That's not surprising: It was the first app to let you run virtualized versions of Microsoft Word, Excel, and PowerPoint on the iPad, and it was free. It still is, at this writing, but since CloudOn is paying software-as-a-service licensing fees to Microsoft, it will have to generate income somehow, so don't expect the free ride to last forever. But even if users had to pay for it, CloudOn would get my endorsement for its simple, straightforward design and its seamless integration with the Web-based file-storage services Box.com and Dropbox. Setup is painless: You download the app, create an account, and link it to your Box or Dropbox account, and you're in business. Launching the app brings you to a minimalist home screen with three top-level buttons. You get a button for choosing between tile and list views of files; one for accessing account settings, help, a tutorial, and a connection status checker; and one for creating a new Word, Excel, or PowerPoint document. Below those three main buttons is a bar with a couple of navigation buttons (back, forward, home screen) and buttons for accessing open documents, sending the open document as an email attachment, and refreshing the screen. Below those icons are your Dropbox documents and folders (displayed as either tiles or a list, depending on which view you choose). Clicking a document opens it in its native application (in addition to the Office apps, CloudOn now supports Adobe Reader and offers an image-file viewer); alternatively, you can create a new document from the main menu. 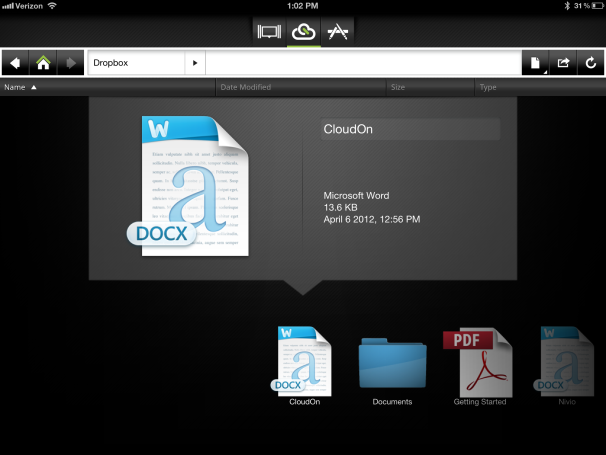 You can also open attachments in the iPad's native mail app directly into CloudOn. Working in an Office app with only your fingertips isn't always easy. CloudOn, however, has rearranged some of the buttons on Office's Ribbon interfaces to make them operate more smoothly on touchscreens. For example, the basic text-formatting buttons are much more spread out in the CloudOn version to accommodate fingertips rather than mouse pointers. The resulting button overflow appears on an Alignment tab that doesn't exist in the desktop version. Compared with the Ribbon on the desktop version of Excel (bottom), the buttons in the CloudOn version (top) are larger to make the application easier to use on a touchscreen. In my tests on an iPad, the apps were quite responsive; CloudOn says that it can run smoothly on connections of only a couple hundred kilobits per second. I particularly like the Dropbox integration; thanks to this feature, you can edit a document on any device and save it to your Dropbox folder, and it will appear on all your devices without further ado. The only thing CloudOn lacks is printer support and a straightforward way of closing an open file (the File tab is grayed out, so you don't get any of those commands). Still, between the thoughtful interface tweaks and the Dropbox integration, I found CloudOn to be a great way to work in Office on my iPad. Since it's currently free, CloudOn is a great bargain--but I'd definitely consider paying for the service if the price is right.